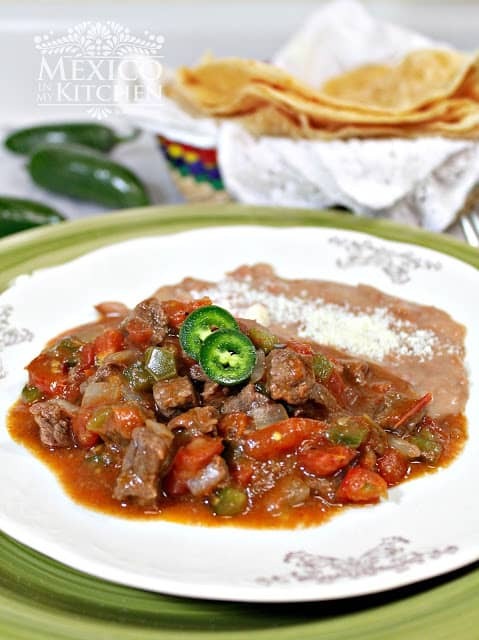 This is a popular dish in the northern states of Nuevo Leon and Coahuila, and it’s very similar to the “carne guisada” dish made in the border towns of Texas. It consists of finely diced beef slow cooked in a tomato stew. Well, pretty much everything in the recipe goes in diced, from the meat to the bell peppers, onions, and tomatoes. It is not a spicy meal, and in some border towns, the cooks add a little bit of flour to thicken the stew. 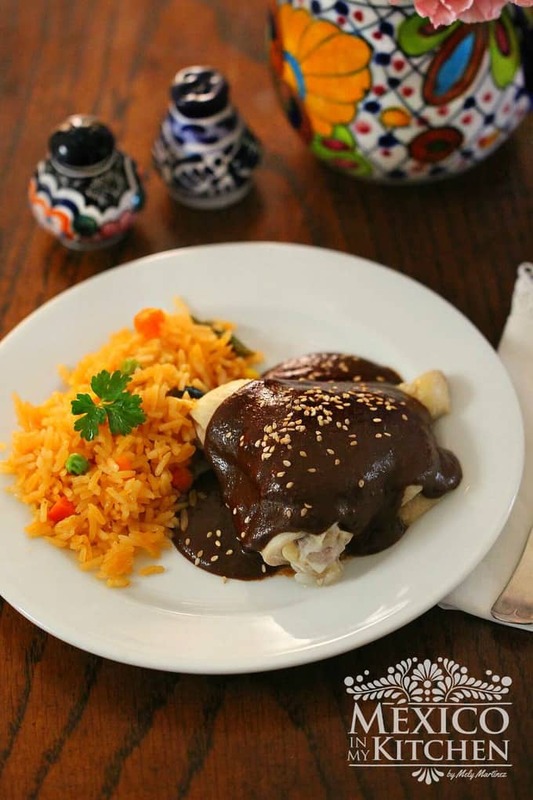 In Monterrey, NL it is served with a side of rice or pinto beans (or both). This dish is also used to make the popular appetizer called “Empalmes”, and in the border towns, it is used as a filling for burritos. I will write about the “Empalmes” in a later post. If you’re the type of person that makes your own lunch to take to work, make yourself extra, since this dish tastes even better the next day, and as a filling for burritos or tortas! While the meat is cooking, grind the garlic, peppercorns and cumin in the molcajete (mortar). Add 2 tablespoons of water to the molcajete mixture to form a paste and add it to the meat. By the time you add this spice mixture, the meat should be releasing its juices. Cook for 5 more minutes and lower the heat and place the lid to slowly cook the meat. Cook the meat for about 20 minutes and before all the liquid gets dry, add the diced onion and green pepper. Stir and cook for 3-4 minutes. Now, add the tomatoes, stir again, and place the lid to slowly simmer the stew. After 20 minutes, check the meat for doneness; depending on the cut of meat the cooking time will vary, it has to be fork tender. Just to be safe, keep checking the stew every 10 to 15 minutes, until you see that the meat is soft. Season with salt a few minutes before it finishes cooking and serve with rice, pinto beans, and warm flour tortillas. Mexican Beef Stew, This is a popular dish in the northern states of Nuevo Leon and Coahuila, and it’s very similar to the “carne guisada” dish made in the border towns of Texas. It consists of finely diced beef slow cooked in a tomato stew. Heat oil (or lard) in a large skillet, at medium-high. Season the meat with salt and add to the saucepan to cook. to the meat. By the time you add this spice mixture, the meat should be releasing its juices. Cook for 5 more minutes and lower the heat and place the lid to slowly cook the meat. Since this type of meat is very lean, I like to cook it with lard to add flavor, but you can use vegetable oil if you prefer. Grinding the fresh spices gives the meat a unique taste compared to dried spices, but you can still use the dried already-ground version. If you prefer to make a spicy version of this dish, add diced jalapeños in step 3. The amount will depend on your personal taste. Some versions of this recipe also add Mexican oregano. Previous Post: « Warning: you’ll want to cook this tonight! My grandmother used to make something like this almost every day. I never knew it had a name. Thanks, I learn so much here. I remember it being called 'Carne guisada" when living in Texas. But, there are a lot of dishes identified as "carne guisada" depending of the region. Yes, you are right . In Texas it is called carne guisada. And it is so tender and delicious. Can I do the dish in a slow cooker? Will the flavor change too much? I think you can add the salsa ingredients along with the meat, maybe you will have to cut the tomatoes a little bit larger. Yes, that is the good thing about this dish, you can make it your own by adding the seasonings according to your personal taste. Thank you for trying the recipe. The best version of this I ever tasted was in an El Paso restaurant several years go. It included roughly chopped pecans as well as the other ingredients you listed, for texture, and did have the Mexican oregano. I have added them to mine ever since. Yours is a lovely recipe. I just made this but for some odd reason my juice is brown & tastes like the meat instead of red in color like it is in your picture. Does anyone know what I did wrong? I followed everything in the recipe. Kaitlyn you have to add 1/2 large can of crushed tomatoes and 2 tbsp brown sugar. If it is thicker than you want you can add some water. Also the leaner cut of beef will not get as tender as a fattier cut nor will it have the depth of flavor. I also added coriander/cilantro. This doesn't cook very long; I would add the browned sirloin after the rest is cooked, if you insist on using any of the leaner cuts. Hope this helps! I made this the other night! I used top round meat and it was delicious! I did double the spices though. Great recipe. I love all your recipes! Thank you for trying the recipe. I love that you adapted it to make it your own. With jalapeños is even better! My grandmother used to have a small Mexican restaurant in South Texas & carne guisada was their most popular dish. They used to make it daily & I do remember that she always added a roux that she made with flour & water. I make it now in my slow cooker but I make sure that I brown the meat first in a hot skillet. Yes, in South Texas, a small amount of flour is added. A really tasty meal. And add – or at what point do I add them? Hello Carol, Add then cut into small cubes right after you add the meat. They will cook together. Thank you for coming back to let me know about it. So glad your family like it! Thank you for this recipe, I was trying to find out which cut of meat my grandma would use for her famous carne guisada, I now know! We live in Texas so of course she would make hers like a gravy, and the cut of meat she’d use would always be so tender. I know exactly how she would make it. Thank you so much for your recipe. I am making it tonight for dinner! I know every cook adds their own seasoning, I hope to can replicate your grandma’s recipe. Don’t forget to write it down to share with the future generations to keep the traditions alive. Thanks a lot for visiting.